Classic green bean casserole and sweet potato casseroles are two of the most popular side dishes served at a holiday meal. Green bean casserole is easy to prepare and the savory flavors of the condensed mushroom soup pairs well with fresh green beans. Throw in a few crispy fried onions and it becomes a classic green bean casserole. 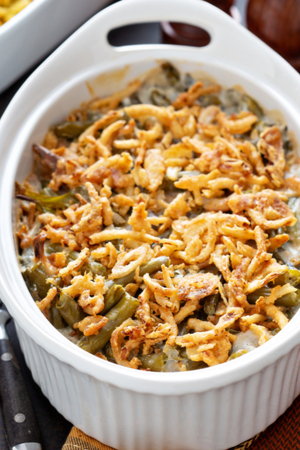 Classic green bean casserole – topped with crispy fried onions. Every year we are asked to bring this recipe to at least one type of gathering. Whether it is a retirement party, graduation party or a family reunion we always get that one phone call pleading us to bring classic green bean casserole. I really never understood why. 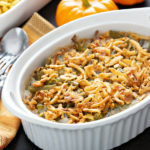 Green bean casserole is such a simple and easy dish to make. In fact, it is one recipe that can be found on both French’s Fried Onion canisters and Campbell’s Condensed Cream of Mushroom soup labels. But everyone tells me that ours is the best! Why this is the BEST Classic Green Bean Casserole Recipe? So when I began to question why, the answer was two-fold. Fresh green beans make a huge difference in the quality of this green bean casserole. First of all, we use fresh green beans for this recipe. 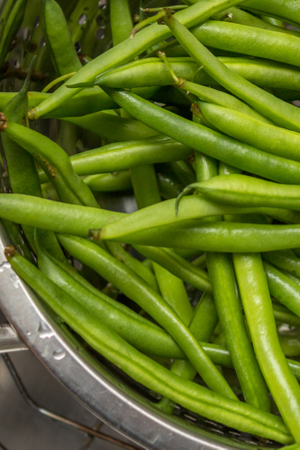 Fresh picked green beans retain their shape and don’t disintegrate when baked. So why not use the two cans of green beans that have been sitting in your cupboard for months? Of course you can. Canned green beans already are soft. So when you bake them in a casserole, they will become even softer. You certainly can make this classic green bean casserole with them. But once you use fresh green beans, you will never go back! 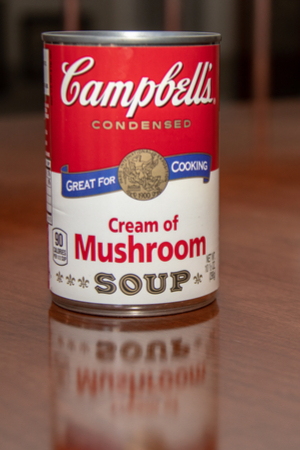 And secondly, we make our own condensed cream of mushroom soup. See: Homemade Condensed Cream of Mushroom Soup recipe. Homemade condensed cream of mushroom soup adds so much flavor to this casserole. Ideally, we will make our homemade condensed cream of mushroom soup a couple of weeks ahead of time. We then freeze it and thaw it out when we go to make our classic green bean casserole. However, as life happens, there are sometimes when we don’t have any in the freezer and are starting from scratch. That gives us an opportunity to add in a few special ingredients to make it even better. 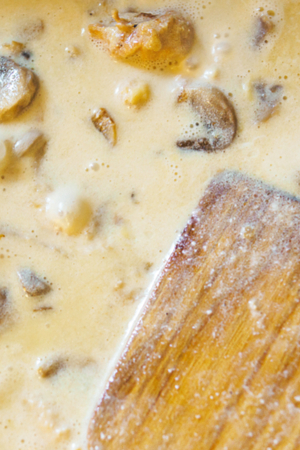 It is easy to incorporate fresh mushrooms in a cream sauce directly into your recipe. It adds so much flavor and a step that shouldn’t be skipped! But be sure to use gourmet mushrooms whenever possible. White button mushrooms have little flavor and will result in a bland sauce. We prefer to use baby Bella or Cremini mushrooms. Of course, if Shitaki mushrooms are available and on sale, then I would definitely add those in as well! Saute the mushrooms with a little onions and garlic. Add in a little flour to thicken everything and some sour cream and heavy cream. Crispy fried onions on top of green bean casserole. Once everything gets nice and thick, add in the crispy fried onions. Mix everything together and put it in a casserole dish. Once the classic green bean casserole has heated through, add a layer of crispy fried onions to the top and brown. 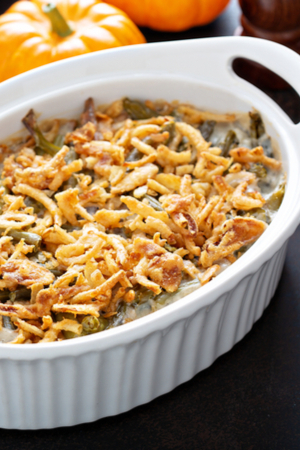 A few minutes later – the classic green bean casserole is ready! Just be prepared for everyone to ask you to make this dish again at the next get together! Fresh green beans lathered with homemade mushroom gravy and topped with crispy fried onions. The perfect side dish for any occasion! Cut the ends off the green beans. Add the green beans to the boiling water and cook for 2-3 minutes. Drain the beans and immediately place them in the ice water bath. When cool, drain and set out to dry on paper towels. In a large skillet over medium-high heat, add the butter. Once the butter is melted and the pan is hot, add the mushrooms. Cook for 1 minute, then add the thyme and garlic and continue cooking the mushrooms have lost most of their moisture (5-7 minutes). Season mushrooms with the salt, pepper, cayenne and nutmeg. Cook 2-3 minutes. Sprinkle the mushrooms with flour and gradually add in the chicken stock. Whisk together and bring to a simmer. Reduce heat and add sour cream and cream, stirring gently. Continue to cook over low heat until gravy thickens (approximately 5 minutes). Add the blanched green beans and 2/3 cup fried onions into a 2 quart casserole dish. Pour the gravy mixture over the green beans and mix to coat. Spread out evenly in the pan. Sprinkle the green beans with the Parmesan. Bake for 20 minutes. Sprinkle the remaining fried onions on top and bake for an additional 5 minutes. Take out of the oven and let sit for 5 minutes before serving.